Alva Hotel Apartments is an elegant hotel, perfectly well situated with easy access to the beach, restaurants, bars and attractions. It sits just 66km from Larnaca International Airport so you can be at your hotel following a brisk car journey. A room at Alva Hotel Apartments is beautifully decorated and well-furnished with essential amenities. 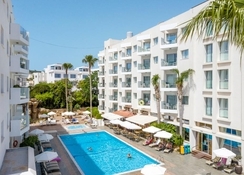 The hotel has a strong set of facilities, all making for a comfortable stay such as a swimming pool with sun terrace, tennis court, games room, children’s playroom, car hire, laundrette and dry-cleaning service and much more. Café Parko is the hotel’s bar-restaurant that serves up a range of delicious local and international dishes that’s just as popular with locals as it is with hotel guests. Venture outside of Alva Hotel Apartments and there’s no shortage of restaurants catering to a wide variety of tastes, from fresh Mediterranean seafood to Italian comfort food to great burgers and much more. And keep the whole family entertained in Protaras with trips to the Ocean Aquarium, National Forest and Magic Dancing Waters Show. Alva Hotel Apartments is located 66km from Larnaca International Airport. It is also a short stroll down to the beach. It has a great location, being surrounded by great restaurants and bars just a short walk along the main thoroughfare of Protara road. There are a few souvenir shops nearby as well as a supermarket, however more extensive food and retails shopping can be found a few miles north. Popular tourist attractions include the Magic Dancing Waters Live Show just over a mile north of the hotel and the Ocean Aquarium, just a 10-minute drive north. A day trip to the natural beauty of Cape Greco National Forest can be had via a short 10-minute drive south towards the south-easternmost part of the island. Rooms at Alva Hotel Apartments are not only clean and comfortable but a pleasure to make your home at for the duration of your stay as they are well-furnished with an elegant design. You will find standard amenities included with your room such as telephone, wi-fi, safe deposit box, tea and coffee making facilities as well as a fully-equipped kitchenette. 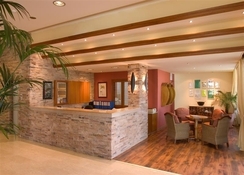 There are three room types at Alva Hotel Apartments. Suites and Studio Rooms accommodate up to three guests with twin beds and an additional fold up bed. 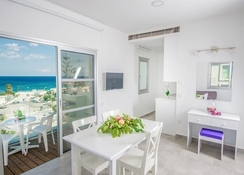 One bedroom apartments are suitable for sleeping up to four guests and keep the bedroom separated from the rest of the apartment as well as featuring a spacious living area. On-site you’ll find Café Parko an excellent bar and restaurant with al fresco dining and a beautiful garden serving international and local dishes. You’ll be spoilt for choice with all of the places to dine or drink out and about in Protaras. The main road, Protaras, is home to numerous restaurants serving Chinese, Italian and seafood as well as authentic Greek and Cypriot dishes. Great bars can also be found. Rockafellas Bar is a great spot to go for a drink and to watch sport on one of the screens. La-pas is an elegant cocktail bar and KOI Lounge Bar and Restaurant combines great food and drinks with amazing sea views. 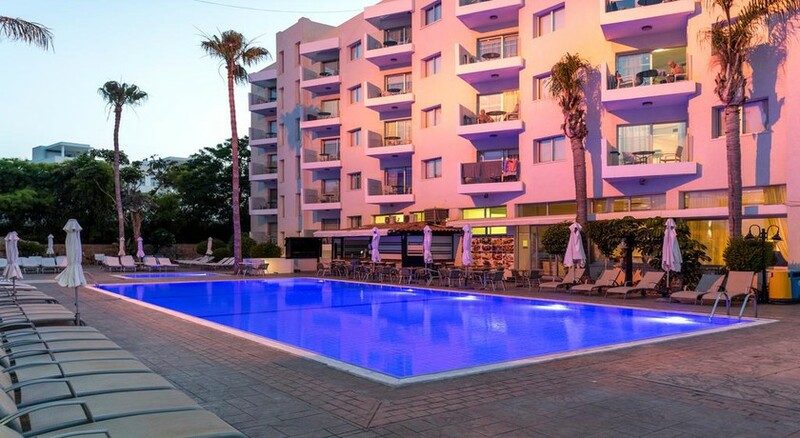 Guests at Alva Hotel Apartments can chill out in the outdoor swimming pool or grab a sunbed and soak in the Cypriot sunshine. Stay active at the tennis court or relax at the games room with pool and video games available and young ones will love the children’s playroom. Unburden yourself with a massage or take advantage of one of the sightseeing tours on offer to guests. Away from the hotel, there are several beautiful golden sand beaches to choose from. An entertaining night for all the family can be had at the Magic Dancing Waters Live Show whilst the Ocean Aquarium and Cape Greco National Forest are ideal daytime activities. Use of a booked room and until 18:00 hours will be charged at 50% of the daily rate. The apartment we stayed in was lovely. We had a great view looking out to sea. It was kept clean. The pool was nice apart from being a tad cold but it was October when we stayed. The hotel staff were very friendly. It was a great holiday.